Beginning in a staggered stance, place your foot in the second to last Easy Grip Loop of your CLX. Place your opposite hand in the desired Easy Grip loop to create the proper resistance when at the top of the exercise. 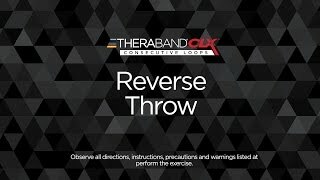 Slowly allow your throwing arm to come down across your body as if you were throwing a ball and then repeat.